Thursday, June 1, 2017 at 9:08 a.m.
Spokane Mayor's Urban Design Awards People's Choice Award Voting Begins Soon - September 18th! The year 2017 marks the 10-year anniversary of the Spokane Mayor's Urban Design Awards and another opportunity to celebrate people who are building the city of choice. These biennial awards highlight the importance of creative thought, technical proficiency, and the relationship of good urban design to our city's economic health and overall well-being. Mayor Condon will announce the awards; and award winners will receive a certificate of recognition and have their projects displayed on the city's website as well as on the third floor of City Hall. What is "urban design" and what is the "public realm?" There are various definitions, but for the purpose of these awards, the following definitions shed some light on the terms. "The public realm is the space to which the public has right of access and the setting for street life." "Urban design is the thoughtful development of spaces that are the setting for street life and activities. It draws together the many components required for functionality, place-making, and sustainability to form places with distinct beauty and identity." The design of our public realm matters because we collectively own these spaces. The public realm includes features that everyone can see or access, and they shape people's opinions about Spokane and whether it's a good city to live in, work in, or visit. How a building meets the street matters, the materials used matter, and the scale of spaces and buildings matter. All of these aspects and many more affect Spokane's character and aesthetics. It has been proven that better designed streetscapes and public spaces typically have less crime, higher pedestrian activity and increased economic activity. You do not have to be an urban designer to know when you are in a well-designed place because they feel good, they are places where memories are made, and they are places we want to come back to and that matters. The City's Design Review Board Members will evaluate submissions and provide recommendations to the Mayor's office. We invite the citizens of Spokane to participate in these awards by voting for their favorite urban design project. 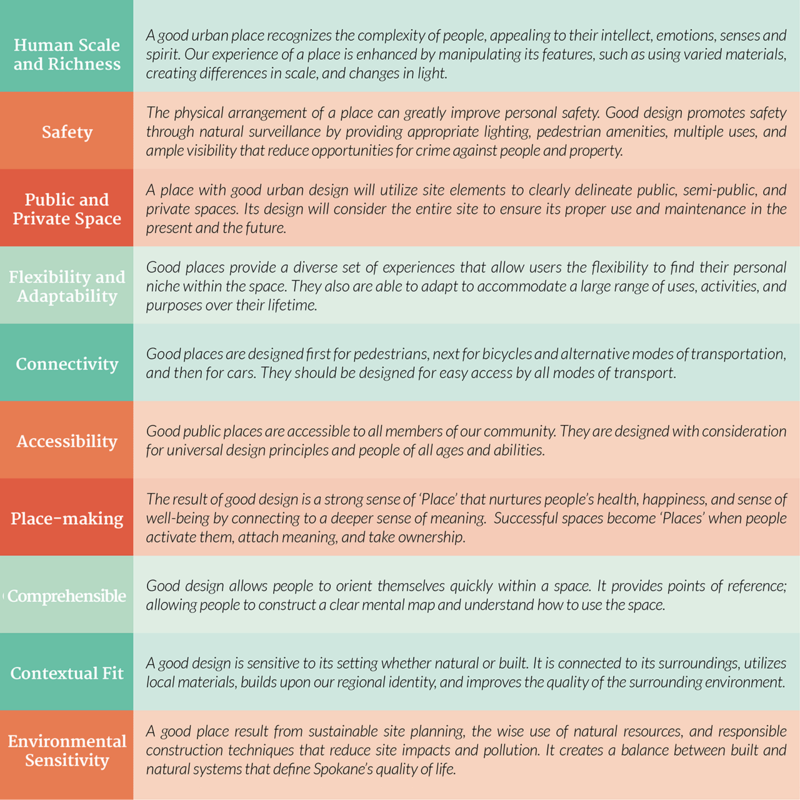 We encourage the community to read the "Qualities of Good Urban Design" and learn a bit about what makes for great urban environments and judge for themselves, which project best demonstrates these qualities. All entries will be on display on the awards web page and at River Park Square for three weeks, where citizens will be able to vote for their favorite submitted design. 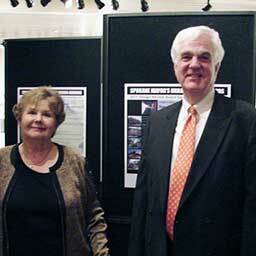 Our highest honor, awarded to projects for singular adherence to and execution of the Principles of good design. An utterly dramatic transformation of space that introduced us to a piece of our city we had ignored for years. The work literally flows into the river, which we see with new eyes and cannot help but explore. Awarded to projects which demonstrate truly excellent adherence to and execution of the Principles of good design. An authentic and rich historic restoration with smart modern improvements. In renovating a key block in downtown Spokane, the developers have made a lasting impact on the entire neighborhood. Despite a massive scale and security concerns specific to schools, this project was cleverly constructed to feel almost like a village and nestle among the site's many old-growth trees. A space that is rich in diversity for its size that is both a gateway to the neighborhood and a vital jumping-off point for the entire Centennial Trail. Convenient, safe, accessible and truly beautiful, this people-centered design fits perfectly into its surroundings and is a transformational project for the Perry Neighborhood. As voted on by the people of Spokane in person and online. In one month, over 1,500 people voted online or in person. This renovation and revitalization project, which turned a historic garage into a food hub and community gathering place, was the clear winner. A special acknowledgement given by the Design Review Board to a design project that has significantly contributed to Spokane's quality of life. The Design Review Board chose to honor the Trail for connecting Spokane to its natural surroundings and forming the backbone of our walkable and bikeable community. A special acknowledgement given by the Design Review Board to a person or group whose work has enhanced Spokane's urban fabric. 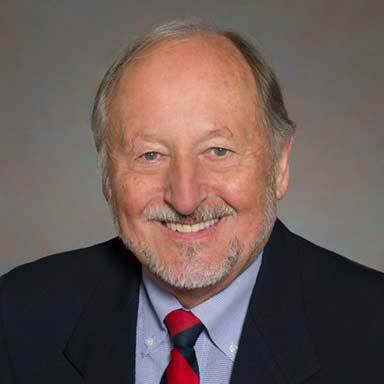 A tireless advocate for developing around the needs of people and communities, Jim Sheehan has done more than just revitalize Downtown's West Main area, that revitalization has changed the whole city. A special acknowledgement given by the Design Review Board to an exceptional project not previously nominated for a Spokane Mayor's Urban Design Award. A nationally recognized renovation to one of Spokane's most iconic and visible buildings. The developers, at great expense, completely rebuilt a fire-damaged mansard roof, which once housed the Spokane Club. A project that exemplifies the perfect blend of adaptive reuse, entrepreneurial spirit, environmental rehabilitation, and respect for the Spokane River, that all great projects should strive to achieve. As voted on by the people of Spokane. Project Team: NAC|Architecture | DCI Engineers | Hellstrom Associates | L & S Engineering | Structural Design Northwest | Ward Design Group | Taylor Engineering, Inc. Submitted by: Bernardo-Wills Architects, P. C.
Submitted by: Bernardo-Wills Architects, P.C. Project Team: Moore, Iacofano Goltsman, Inc., Michael Terrell, ASLA, Jones and Jones, Ltd., Robert Peccia, Economic Research Associates, Thomas, Dean & Hoskins, Friends of the Falls Board of Directors, Mayor James E. West, Spokane Park Board, Sen. Lisa Brown, Sen. Brad Benson, Rep. Timm Ormsby, Rep. Hans Dunshee, Spokane Tribe of Indians, Peaceful Valley, Browne's Addition, West Central, 2nd West Hills Neighborhood Councils, Downtown Spokane Partnership, Avista Utilities, City of Spokane, Numerous additional stakeholder groups, hundreds of citizen participants. Submitted by: Womer and Associates, Inc.
Project Team: Womer and Associates, Inc. | J.M. Grinnell, Contracting, Inc.| Richard Kielbon, R.A.
Project Team: Womer and Associates, Inc.| J. Kimball Barnard, AIA | George Doran, General Contractor, Inc.
To recognize the efforts of Elsie Cobb, Marie Pizelo, Harry Bright, Site Management and other tenant volunteers of Cathedral Plaza for their "Cathedral Plaza Tenant Flower Bed Project".